"Shearing" redirects here. For other uses, see Shear (disambiguation). 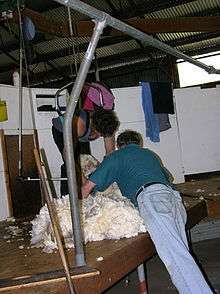 Machine shearing a Merino, Western Australia. The shearer is using a sling for back support. Sheep shearing is the process by which the woollen fleece of a sheep is cut off. The person who removes the sheep's wool is called a shearer. Typically each adult sheep is shorn once each year (a sheep may be said to have been "shorn" or "sheared", depending upon dialect). The annual shearing most often occurs in a shearing shed, a facility especially designed to process often hundreds and sometimes more than 3,000 sheep per day. Sheep are shorn in all seasons, depending on the climate, management requirements and the availability of a woolclasser and shearers. Ewes are normally shorn prior to lambing, but consideration is typically made as to the welfare of the lambs by not shearing during cold climate winters. Shorn sheep tolerate frosts well, but young sheep especially will suffer in cold, wet windy weather (even in cold climate summers). In this event they are shedded for several nights until the weather clears. Some sheep may also be shorn with stud combs which leave more wool on the animal, giving greater protection. Sheep shearing is also considered a sport with competitions held around the world. The wealth of ancient Knossos, Europe's oldest city, derived from its sheep wool industry. The largest group of Linear B tablets is the great archive principally of shearing records though also of sheep breeding. The medieval English wool trade was one of the most important factors in the English economy. The main sheep-shearing was an annual midsummer (June) event in medieval England culminating in the sheep-shearing feast. It had always been conventional practice to wash sheep. The dirty fleeces were hard to shear and demanded that the metal blade shears be sharpened more often. Wool in Australia was carted by bullock team or horse teams and charged by weight. Washed wool was lighter and did not cost as much to transport. The practice of washing the wool rather than the sheep evolved from the fact that hotter water could be used to wash the wool, than that used to wash the sheep. When the practice of selling wool in the grease occurred in the 1890s, wool washing became obsolete. Australia and New Zealand had to discard the old methods of wool harvesting and evolve more efficient systems to cope with the huge numbers of sheep involved. 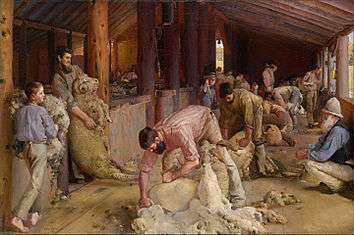 Shearing was revolutionized by the invention of an Australian sheepgrower, Frederick York Wolseley. His machines made in Birmingham England by his business The Wolseley Sheep Shearing Machine Company were introduced after 1888, reducing second cuts and shearing time. By 1915 most large sheep station sheds in Australia had installed machines, driven by steam or later by internal combustion engines. Shearing tables were invented in the 1950s and have not proved popular, although some are still used for crutching. In the US, the worldwide shortage of shearers is becoming a consideration for those wanting to expand wool production. With sheep numbers declining in that country the profession sees significantly less interest in becoming a qualified shearer. Importing labour during the Australian off-season has also become problematic because of delays in obtaining work visa and because shearers numbers are limited worldwide. Throwing a fleece onto a wool table. press and store the wool until it is transported. In 1984 Australia became the last country in the world to permit the use of wide combs, due to previous Australian Workers' Union rules. Although they were once rare in sheds, women now take a large part in the shearing industry by working as pressers, wool rollers, roustabouts, wool classers and shearers. A sheep is caught by the shearer, from the catching pen, and taken to his “stand” on the shearing board. It is shorn using a mechanical handpiece (see Shearing devices below). The wool is removed by following an efficient set of movements, devised by Godfrey Bowen in c. 1950, (the Bowen Technique) or the Tally-Hi method developed in 1963 and promoted by the Australian Wool Corporation. Sheep struggle less using the Tally-Hi method, reducing strain on the shearer and there is a saving of about 30 seconds in shearing each one. 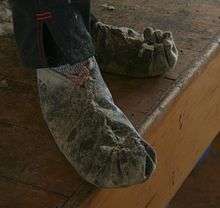 Shearers wear moccasins to protect their feet, grip wooden floors well, and absorb sweat. The shearer begins by removing the belly wool, which is separated from the main fleece by a roustabout, while the sheep is still being shorn. A professional or "gun" shearer typically removes a fleece, without significantly marking or cutting the sheep, in two to three minutes, depending on the size and condition of the sheep—less than two minutes in elite-competitive shearing. The shorn sheep is released and removed from the board via a chute in the floor or in a wall, to an exterior counting-out pen. Once the entire fleece has been removed from the sheep, the fleece is thrown, clean side down, on to a wool table by a shed hand (commonly known in New Zealand and Australian sheds as a roustabout or roustie). The wool table top consists of slats spaced approximately 12 cm apart. This enables short pieces of wool, the locks and other debris, to gather beneath the table separately from the fleece. The fleece is then skirted by one or more wool rollers to remove the sweat fribs and other less desirable parts of the fleece. The removed pieces largely consist of shorter, seeded, burry or dusty wool etc. which is still useful in the industry. As such they are placed in separate containers and sold along with fleece wool. Other items removed from the fleece on the table, such as faeces, skin fragments or twigs and leaves, are discarded a short distance from the wool table so as not to contaminate the wool and fleece. Following the skirting of the fleece, it is folded, rolled and examined for its quality in a process known as wool classing, which is performed by a registered and qualified wool classer. Based on its type, the fleece is placed into the relevant wool bin ready to be pressed (mechanically compressed) when there is sufficient wool to make a wool bale. In some primitive sheep (for example in many Shetlands), there is a natural break in the growth of the wool in spring. By late spring this causes the fleece to begin to peel away from the body, and it may then be plucked by hand without cutting – this is known as rooing. Individual sheep may reach this stage at slightly different times. Whatever device is used, shearers must be careful to keep it clean so as to prevent the spread of disease amongst a flock. Blade shears consist of two blades arranged similarly to scissors except that the hinge is at the end farthest from the point (not in the middle). The cutting edges pass each other as the shearer squeezes them together and shear the wool close to the animal's skin. Blade shears are still used today but in a more limited way. Blade shears leave some wool on a sheep and this is more suitable for cold climates such as the Canterbury high country in the South Island of New Zealand where approximately half a million sheep are still shorn with blade shears each year. For those areas where no powered-machinery is available blade shears are the only option. Blades are more commonly used to shear stud rams. Machine shears, known as handpieces, operate in a similar manner to human hair clippers in that a power-driven toothed blade, known as a cutter, is driven back and forth over the surface of a comb and the wool is cut from the animal. The original machine shears were powered by a fixed hand-crank linked to the handpiece by a shaft with only two universal joints, which afforded a very limited range of motion. Later models have more joints to allow easier positioning of the handpiece on the animal. Electric motors on each stand have generally replaced overhead gear for driving the handpieces. The jointed arm is replaced in many instances with a flexible shaft. Smaller motors allowed the production of shears in which the motor is in the handpiece; these are generally not used by professional shearers as the weight of the motor and the heat generated by it becomes bothersome with long use. Animal welfare organizations have raised concerns about the abuse of sheep during shearing, and have advocated against the selling and buying of wool products. In 2013, an anonymous shearer reported instances of animal abuse by workers, an allegation to which an Australian Worker's Union representative added that he had witnessed "shearers gouge eyes and break sheep jaws." Australian Wool Innovation insisted that animal welfare was a priority among shearers. The following year, the RSPCA began a cruelty investigation following the release of video footage that PETA said was taken in more than a dozen shearing sheds in New South Wales, Victoria and South Australia. The Guardian reported that the video showed, "sheep being roughly handled, punched in the face and stamped upon. One sheep was beaten with a hammer while another was shown having a deep cut crudely sewn up." The Shearing Contractors Association of Australia "applauded" the investigation, and Wool Producers Australia president Geoff Fisken said the behavior shown in the video was “unacceptable and unsupportable" but that "we’re sure it doesn't portray the 99.9pc majority of wool shearers - and those shearers would be appalled by it as well”. but good cheer and welcome, like neighbors to haue"
Shearing the Rams, a painting by Australian painter Tom Roberts is like an icon for the livestock-growing culture or "life on the land" in Australia. It was parodied in Michael Leunig's Ramming the Shears. The expression that Australia's wealth rode on the sheep’s back in parts of the twentieth century no longer has the currency it once had. In 2001, Mandy Francis of Hardy's Bay, Australia, constructed a blackbutt seat for the Street Furniture Project at Walcha, NSW, Australia. This seat was inspired by the combs, cutters, wool tables and grating associated with the craft and industry of shearing. During Australia's long weekend in June 2010, 111 machine shearers and 78 blade shearers shore 6,000 Merino ewes and 178 rams at the historic 72 stand North Tuppal station. Along with the shearers there were 107 wool handlers and penners-up and more than 10,000 visitors to witness this event in the restored shed. Over this weekend the scene in Tom Robert's Shearing of the Rams was twice re-enacted for the visitors. Many stations across Australia no longer carry sheep due to lower wool prices, drought and other disasters, but their shearing sheds remain, in a wide variety of materials and styles, and have been the subject of books and documentation for heritage authorities. Some farmers are reluctant to remove either the equipment or the sheds, and many unused sheds remain intact. Sheep shearing and wool handling competitions are held regularly in parts of the world, particularly Ireland, the UK, South Africa, New Zealand and Australia. As sheep shearing is an arduous task, speed shearers, for all types of equipment and sheep, are usually very fit and well trained. In Wales a sheep shearing contest is one of the events of the Royal Welsh Show, the country's premier agricultural show held near Builth Wells. The world's largest sheep shearing and wool handling contest, the Golden Shears, is held in the Wairarapa district, New Zealand. The shearing World Championships are hosted by different countries every 2–3 years and eight different countries have hosted the event. The first World Championships were held at the Bath & West showground, England, in 1977, and the first Machine-Shearing winner was Roger Cox from New Zealand. Other countries that have hosted the sheep shearing World Championships have been New Zealand (3 times), England (3 times), Australia (2 times), Wales, Ireland, Scotland, South Africa & Norway. Out of 13 World Championships, New Zealand have won the team Machine contest 10 times, and famous New Zealand sheep-shearer David Fagan has been World Champion a record 5 times. World Shearing Championships results are  World Blade Shearing has been dominated by South African and Lesotho shearers, Fine Wool machine shearing dominated by Australian shearers, and New Zealand dominating the Strong Wool machine shearing. Shrek (sheep) – a hermit sheep that became notable in New Zealand for his extraordinarily thick fleece after avoiding being shorn for six years. ↑ "The Land". The Land. Richmond: Rural Press. 13 March 2008. ↑ Moule, Dr G.R. (1972). Handbook for Woolgrowers. Australian Wool Board. p. 186. ↑ "Chisholm, Alec H.". The Australian Encyclopaedia. 8. Sydney: Halstead Press. 1963. p. 86. Shearing. ↑ Court, Jane; Sue Hides; John Webb-Ware (2010). Sheep Farming for Meat and Wool. Csiro Publishing. p. 183. ISBN 064310206X. Retrieved 30 December 2013. ↑ "The Bowen Technique". Retrieved 26 August 2008. ↑ "Sheep parasites". Retrieved 10 November 2008. ↑ Julian Cribb (26 June 1998). "CSIRO Media Release: REVOLUTIONARY WOOL HARVESTING TAKES OFF". CSIRO. Retrieved 26 August 2008. ↑ Devantier, Alecia T.; Carol A. Turkington (2009). Extraordinary Jobs with Animals. Infobase Publishing. p. 99. ISBN 1438111703. Retrieved 29 December 2013. ↑ "Welfare group targets abuse in Australian shearing sheds". Retrieved 17 September 2014. ↑ Kath Sullivan,"Union concerned about shearers mistreating sheep," ABC Rural, 17 October 2013. ↑ Oliver Millman, "Sheep cruelty video sparks RSPCA investigation," The Guardian 10 July 2014. ↑ Colin Bettles, "Shearers back PETA: no excuse for cruelty," FARMONLINE, 11 July 2014. ↑ Tusser, Five Hundred Points of Good Husbandry, 1557. ↑ Sim, Terry; Hough, Cassie (10 June 2010). "Shear spectacular sparks pilgrimage". The Land. North Richmond, NSW: Rural Press. pp. 16–19. ↑ "Shearer sets records". ABC News Online. 6 March 2007. Retrieved 26 August 2008. ↑ Rattue, Chris (2011). "Star Profile: David Fagan – Shearing – NZ Herald News". The New Zealand Herald. Retrieved 27 February 2011.